Graduate Aptitude Test for Engineering, GATE 2019 online application portal, GOAPS would close today. Candidates interested in applying for the examination can fill the online application form on the official website gate.iitm.ac.in. Please note, the last date for filling the GATE 2019 application form without late fee was September 23, 2018 and with late fees is today, October 1, 2018. The aspirants must note that the request for the change of examination city is November 16. After the registration process is over, the admit cards will be released. Once the admit cards are formally released by the officials, the same will be available on the official website of GATE. According to the officials, the GATE 2019 admit cards will be available from January 4. The students will be able to download and take a print out of GATE 2019 admit cards from the GOAPS website. GATE 2019 results will be declared on March 16. The Graduate Aptitude Test Engineering or GATE is a national level engineering entrance examination conducted jointly by the Indian Institute of Science and seven Indian Institutes of Technology. This year, the GATE 2019 exam is scheduled to be conducted on February 2, 3, 9 & 10, 2019. 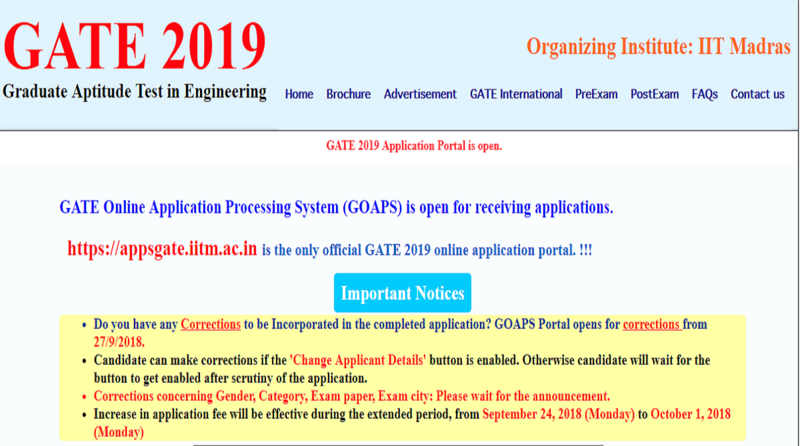 The candidate who will be appearing for the GATE 2019 can fill the application form in the GOAPS (GATE Online Application Processing System) official website gate.iitm.ac.in. How can a good GATE score fetch you a great job?